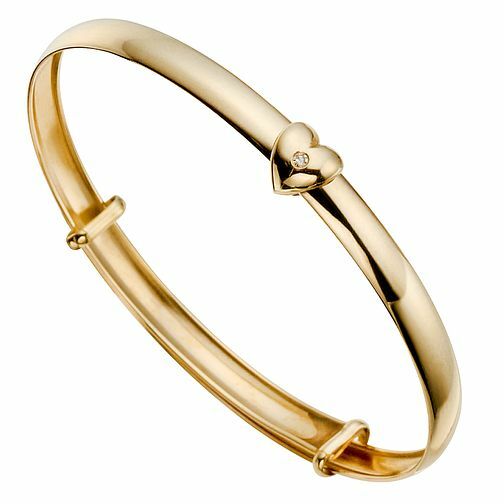 9ct yellow gold, diamond heart bangle. Children's 9ct Yellow Gold Diamond Bangle is rated 4.5 out of 5 by 4. Rated 5 out of 5 by Anonymous from Perfect This product is delicate and beautiful, perfect gift for my goddaughters christening! Rated 3 out of 5 by Anonymous from to large for baby Bought for my grand daughter in celebration for her christening. Pre purchase I questioned and was informed by the shop assistant that the bangle would adjust to size, this was important to me as bangle appeared to be was on the large size and I wanted my grand daughter of 9 months to wear it on her special day. Regret this was not the case, as a result she did not wear it as her parents feared losing it.